"The Search is Over" for Broadway's “Rock of Ages"
Constantine Maroulis rocks out with the cast of "Rock of Ages." 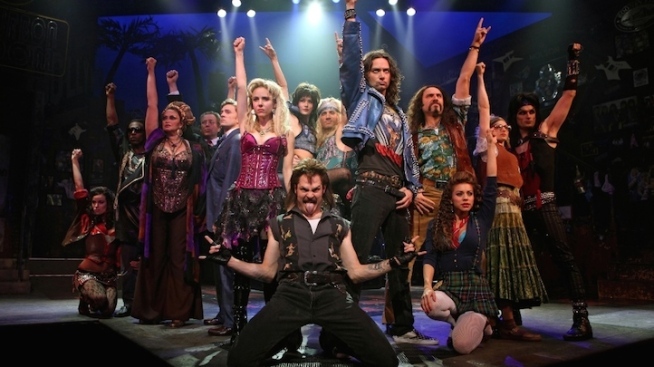 “Rock of Ages” will plays its final Broadway performance at the Helen Hayes Theatre on Jan. 18. At the time of its closing, it will have played 22 previews and 2,328 performances — making it the 27th longest running show in Broadway history. The ‘80s jukebox musical, with a book by Chris D'Arienzo, features rock hits from many of the glam metal bands of the decade, like Poison, Bon Jovi, Pat Benatar, Twisted Sister, Styx, Journey, Steve Perry and Europe. Tom Cruise, Alec Baldwin, Russell Brand and Julianne Hough starred in the 2012 movie adaptation. "Rock of Ages" had a bit of an unconventional road to Broadway, beginning at The Vanguard Hollywood nightclub in Los Angeles back in January 2006. A limited run at The Flamingo in Las Vegas followed, before “Rock of Ages” made its way to New York in October 2008 at Off-Broadway’s New World Stages. The show officially opened on Broadway on April 7, 2009, and received five Tony nominations that year, including for Best Musical and Best Actor in a Musical for star Constantine Maroulis. Maroulis has rejoined the cast of “Rock of Ages” -- along with six other members of the original cast -- and will remain with the production through closing. They’re joined by YouTube famer Chester See and “Big Brother” star Frankie Grande (brother of Ariana), who are both new to the show. For tickets and more information, visit rockofagesmusical.com.